Developing a phosphate project requires a team of experts including geologists, metallurgists, engineers, and marketing specialists, who can define the feasibility of a project in sufficient detail to obtain permitting and financing. The steps from a resource, to a reserve, to an economic project, are achieved by performing feasibility studies. We are familiar with the latest advances in mineral processing and fertilizer technology and can develop a program to successfully turn bench and pilot plant test work into sound commercial plant designs. 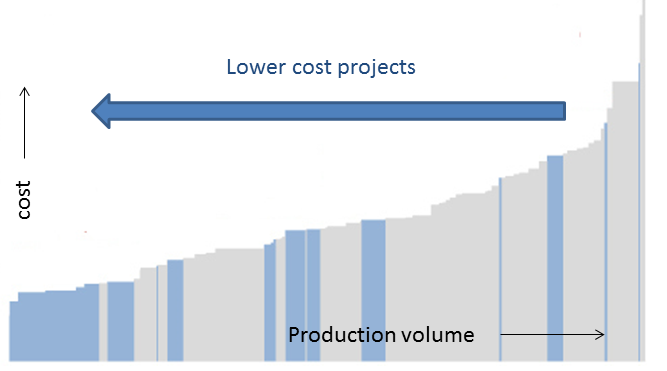 We have proven our ability to develop beneficiation flowsheets that can drive your project towards the lower end of the cost curve. The correct technical and economic balance should be studied early in the project. Although phosphate rock P2O5 grade and recovery are important its end use of the rock has to be considered. It is wasteful to “over-beneficiate” the phosphate or focus too much on grade and recovery at the expense of impurity levels in the product. The configuration of a phosphate mine and beneficiation plant with the related facilities is important economically, because phosphate rock has a relatively low unit value. KEMWorks specializes in integrating geology, mining, and beneficiation with the downstream facilities that process phosphate rock. In that way, the overall economic return may be optimized. In today’s global economy, phosphate rock must be produced to meet quality specifications at a competitive price. In an integrated phosphate complex the selection of a sulfur-burning sulfuric acid plant or the import of sulfuric acid will have a major impact on the site energy balance and phosphoric acid route selection. A sulfur-burning sulfuric acid plant can produce all the LP steam need for phosphoric acid concentration and with a turbo-generator it can also produce power for export. A phosphate complex that imports sulfuric acid will have to minimize the need for LP steam. The choice of phosphoric acid process routes depends on many factors including rock quality, location, availability of raw material supplies, and environmental factors. Phosphate fertilizer products (SSP, TSP, DAP, MAP, and NPK) have different phosphoric acid quality requirements. The production of related products can be included in the feasibility study according to market needs. These can include animal feeds (MCP and DCP) from defluorinated phosphoric acid, purified acid production, and the recovery of uranium from phosphoric acid. During the production of phosphoric acid fluoride gases are evolved that may be recovered as fluorosilicic acid (FSA or H2SiF6).